The Gay Gamer: Is that a jar of bees in your pocket, Donkey Kong, or are you just happy to see me? Is that a jar of bees in your pocket, Donkey Kong, or are you just happy to see me? 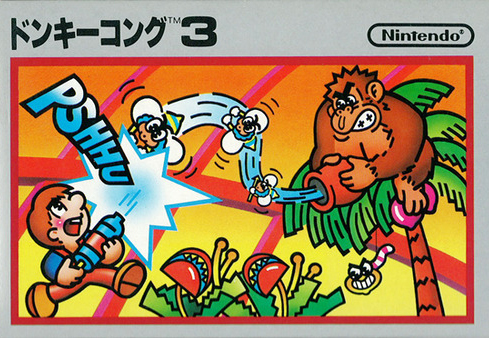 Is Donkey Kong shooting bees out of a honey jar on the cover of the oft-maligned Donkey Kong 3, or is he shooting them out of something a bit more, er, organic? Blogger Drew Mackie asked a variation of the question above in a recent post (read it here), and after inspecting said piece of cover art I have to agree with him that the answer *could* be the latter. Noooooooo I never wanted to look at Donkey Kong like that! It's gotta be jar of bees. If not, imagine the pain involved. D: Actually, don't. Ever. 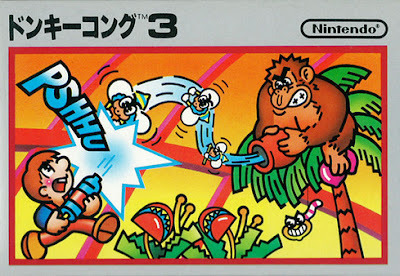 This post almost makes me want to look through game covers though and see what else might look a little weird. As for looking over other old box covers for similarly weird imagery, Marcus, I'm with you 100%! Way to feature someone who has been one of my favorite bloggers from way back in the day. :-) And...yikes. Remind me to stay away from bees forever. And DK3. Umm...was there a DK2? I actually found out about Drew through you, Justin. I saw a link to his blog on your blog, checked it out and became immediately hooked. I think he is hap-BEE to see you. Definitely an unfortunate position for them to have placed the jar...wonder if it was intentional mischief on the part of the artist. If so, my hat is off to him/her! The talk of old box art in the comments reminds me of the retro Mega Man box art, though. Ugh,that stuff is terrible, but so, so ... nostalgic. You're talking about the old NA/US Mega Man box art, right Gaelach Rose? If so, yeah, that was baaaaaaad. Man, those Pokémon are blocky!